Making your own clasps really increases the handmade aspect of your jewelry designs. 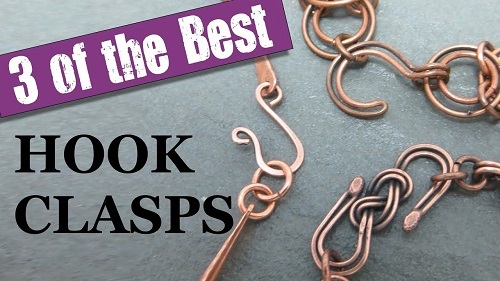 Lily-tree has 3 styles of wire hook clasps in her tutorial. The first one is the simplest kind. But the others are sure different and fun. You will need 18 or 20 G wire. I generally recommend 18 G for clasps which is thicker and thus stronger. Thicker wire also looks less anemic. However, 20 G will be easier to use for the knotted wire clasp. This third style also requires balling the wire ends with a torch and pickling (cleaning in a dilute acid) afterwards. I love how this designer teamed up each of her clasps. The simplest one with hammered wire connectors (Lisa Yang has a great tutorial for this). The second one goes with a chain maille bracelet and the knotted one features similar knotted connectors! away from that and make my own. These are great. Love the knotted one! !